CircuitPython is a derivative of MicroPython designed to simplify experimentation and education on low-cost microcontrollers. It makes it easier than ever to get prototyping by requiring no upfront desktop software downloads. 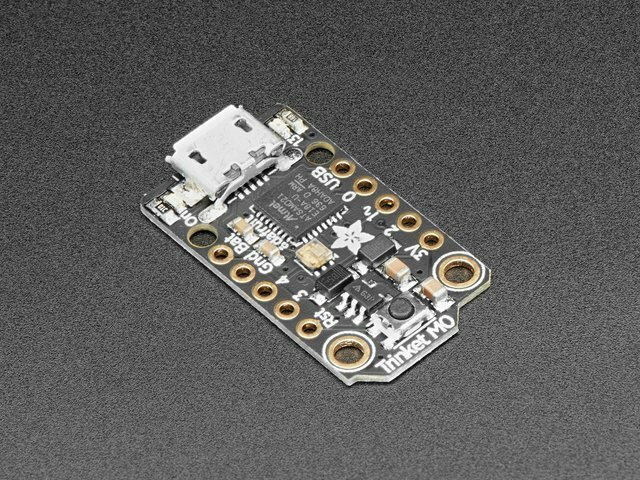 The trinket M0 is the second board that comes pre-loaded with CircuitPython. Simply copy and edit files on the CIRCUITPY drive to iterate. Plug your Trinket into your computer using a known-good USB cable. Double-click the small Reset button next to the Trinket M0 name printed on your board, and you will see the Dotstar RGB LED turn green. If it turns red, check the USB cable, try another USB port, etc. Note: The little LED below the USB connector will be red - this is ok! You will see a new disk drive appear called TRINKETBOOT. The red LED will flash. Then, the TRINKETBOOT drive will disappear and a new disk drive called CIRCUITPY will appear. Trinket M0 is limited on space. As you begin working on projects, you may run out of space. Operating systems can create hidden files that take up space. To prevent these files from being added to your Trinket, we suggest installing the Trinket Default Zip. If you haven't already, plug your Trinket into your computer using a known-good USB cable. If you'd like to reset your Trinket to the same files it shipped with, you can do that with these files. If you changed main.py, and you want to keep your changes, back up main.py first. This guide was first published on Aug 23, 2017. It was last updated on Aug 23, 2017. This page (CircuitPython) was last updated on Apr 20, 2019.